www. 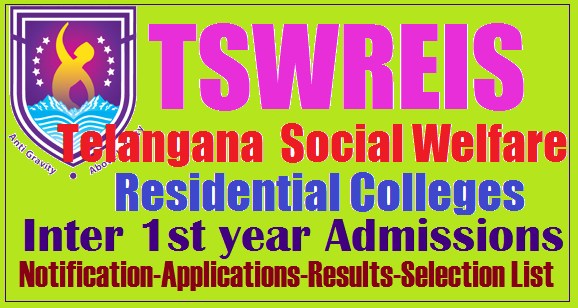 tswreis.telangana.gov.in/ #TSWREIS #Inter 1st year #admissions 2019- Telangana Social welfare Inter admissions 2019: TS Social Welfare RJC Gurukulam Inter admissions Telangana Social Welfare Residential Educational Institutions Society : Hyderabad Admission Into MPC, BPC, MEC, CEC & HEC Groups For The Academic Year 2019-20: TSWREIS Inter First Year Admissions 2019 Notification/Telangana Social Welfare Inter Admissions 2019/TSW Residential Inter Admissions 2019/ TS Social Welfare Junior Inter admissions 2019: Telangana Social Welfare Residential Educational Institutions Society(TSWREIS) has issued the TSWR Inter Admissions 2019 notification in January, 2019. The TSWREIS officials are inviting the online application forms from the eligible SSC passed Boys and Girls for admissions into Junior Intermediate into TSWRJC Institutions in the State for the academic year 2019-2020. The following are the instructions to apply for admissions. Applications are invited from Boys and Girls for admissions into 1st year intermediate MPC (with IIT- JEE/EAMCET coaching) and BPC (with NEET Coaching) and MEC/CEC (with CA-CPT, CLAT, Admission into Other Prestigious Institutions and Other competitive exams) with English as the medium of instruction for the academic year 2019-2020. TSWREIS(Telangana Social Welfare Residential Educational Institutions Society)Hyderabad has issued theTS Social Welfare Inter First Year 2019 Admissionsnotification Into MPC, BPC, MEC, CEC & HEC Groups For The Academic Year 2019-20 . The TSWREIS officials are inviting the online applicationforms from the eligible SSC passed Boys and Girls for admissions into Junior Intermediate into TSWRJC Institutions in the State for the academic year 2019-2020. Applications are invited from Boys and Girls for admissions into Junior Intermediate into 118 Upgraded TSWR Institutions in the State for the academic year 2019-2020. The following are the instructions to apply for admissions. 1. The students who are appearing for SSC Public Examination in March-2019 / 10th class from ICSE / CBSE on regular basis are eligible to write the entrance test. The students who secure A1 to B2 in SSC are eligible for admission in to SAINIK/IIT/COEs and the students who pass SSC in March, 2019 (on regular basis) are eligible for admission into General (Non specialized) institutions and Vocational Colleges. 2. The annual income of the parent shall not exceed Rs.2,00,000/- per annum (for Urban students) and Rs.1,50,000/- (for Rural students) as certified by MRO. 3. The students from Telugu Medium OR English Medium are eligible for this entrance test. 4. The age of the students shall not exceed 17 years as on 31.08.2019. In case of SC students and SC converted Christian relaxation of age for 2 years will be allowed. 5. The students should produce all relevant certificates at the time of admission, then only the admission will be confirmed. Scheme of Examination: Question paper shall be issued in Telugu/English (bilingual) only. Test will be conducted in Objective type (Multiple Choice) for English, Maths, Physical Science, Bio-Science and Social Studies irrespective of groups. Theduration for the test is 2½ hrs. i.e. either to TSWREI Society (OR) TTWREI Society Junior Colleges for the academic year 2019-20 for GURUKUL JC-CET 2019 through online by visiting www.tswreis.in. i. The candidate shall first go through the information bulletin carefully and satisfy their eligibility for appearing for GURUKUL JC-CET 2019.
ii. The candidate after satisfying himself/ herself about the eligibility criteria for the submission of application through online should pay a fee of Rs.100/- through ONLINE or through Credit card (Payment gateway ) from 09-01-2019 to 23-01-2019 for submission of application through Online. #TSWREIS Inter First Year Admissions 2019 Notification. #Online Application Form for TSWREIS Inter Admissions 2019. # TSWREIS Inter Admissions List of Colleges and Groups 2019. Tags: tswreis inter admissions 2019,ts social welfare inter first year admissions 2019, tswreis inter first year/1st year admissions 2019, ts social welfare inter admissions 2019 tswreis inter first year admissions 2019,ts social welfare inter admissions 2019,eligibility criteria, how to apply,application form ,tswreis.telangana.gov.in, tswrjc swreishms.cgg.gov.in/coe inter admissions, tswr jr college admissions 2019, tswreis inter admissions 2019 notification, dates, application form, check here complete details about tswreis inter admissions 2019 : notification, online application form, eligibility, how to apply, reservation details, last date for application, counseling details.